Rocket-powered aircraft took to the sky April 24 in Tulsa, Okla. to showcase the Rocket Racing League, and kick off the league's 2010 World Exhibition Tour. Tworocket-powered competitive aircraft took off together Saturday to showcase theRocket Racing League's new aerial muscle machine as it kicks off a 2010 WorldExhibition Tour. 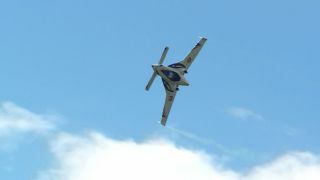 Theleague unveiled its new MarkIII X-racer rocket plane in the high-flying event, which was part of the QuikTripAir & Rocket Racing Show in Tulsa, Okla. Beginning this year and stretchinginto 2011, the Rocket Racing League will conduct a series of demonstrations atair shows across the country. Theseexhibitions are aimed at building up the league?s fan base, in addition toperfecting operations and technologies before the league?s official launch in2012, said Ramy Weitz, CEO of the Rocket Racing League, who participated in alive webcast of the April 24 demo flights in Tulsa. TheRocketRacing League was founded in 2005 by X Prize founder Peter Diamandis, andGranger Whitelaw, a two-time Indianapolis 500 champion team member. Theleague features rocket-powered aircraft, called X-racers, flown by Top Gun andother acrobatic and military pilots in closed-circuit and drag-style races thatpit two to 10 racers against each other in a virtual, custom-designed 3-Draceway in the sky. Thecurrent X-racer models are using a Velocity airframe and a single-thrust liquidoxygen and ethanol rocket engine developed by the Texas-based ArmadilloAerospace. Unlikea regular jet engine that burns oxygen from the atmosphere as its oxidizer, X-racers carrytheir own oxidizer in the form of liquid oxygen. The current Mark II and MarkIII X-racer designs fly at speeds of over 200 mph (322 kph). The X-racer engines are filled with 500 pounds of liquid oxygen and 500 poundsof ethanol, before being pressurized with helium to 320 psi (pound-force persquare inch). When ignited, the engine produces a 15-foot flame and about 2,500pounds of thrust that gives the vehicle liftoff within 4 seconds of ignition. Theentire fuelling process takes approximately one hour. In Tulsa, the leaguedemonstrated its ability to have a very small crew fuel both X-racerssimultaneously. Beforethe X-racers took to the sky in Oklahoma, a Cessna 420 aircraft demonstratedthe new technology that makes possible the Rocket Racing League?s 3-Dvirtual racecourse. Acockpit-based Augmented Reality System projects the racecourse onto 3-Dhelmet displays that enable the pilots to see the race track right on theirvisors. The exhibition in Tulsa was the first time that the helmets andracecourse technology were exhibited to the public. Spectatorsat the event could view the superimposed augmented reality on large projectionscreens, and could follow as the Cessna manoeuvred through virtual gates tocomplete the course. InSaturday?s demonstration, Rocket Racing League Chief test pilot Len Fox flewthe ?T-1? X-racer, while test pilot Dave Morss flew the new Mark III ?T-2?plane. Intheir first flight, both planes lined up at the end of the runway, with Foxtaking off first, and Morss following 13 seconds after. Sincethe rocketplanes have no throttle, the pilots turn their engines on and offthroughout the flight in a series of thrusts and glides. Theplanes carry enough fuel for a total of two minutes of thrust. So, once realracing begins, the winning pilot will likely be the one who most effectivelymanages the plane?s energy under such constraints, Diamandis said. In Tulsa, the league?s first demonstration flight went off without a hitch. Intheir second planned flight, they prepared to fly the X-racers in closerproximity to one another, but an anomaly forced both planes to land shortlyafter they took off. ?Theengines that these X-racers use are computerized,? said Diane Murphy, a publicrelations official with the Rocket Racing League. ?Ifthe computer detects that there?s any sort of anomaly, or anything that couldpotentially be not right, it shuts down the engine,? Murphy told SPACE.com ?Intoday?s second flight, when one of the pilots went to go full throttle, thecomputer had shut the engine down.? Bothpilots were able to glide back to the runway and land safely. Moving forward,engineers will perform more tests and analysis on the X-racers in order tounderstand what caused the anomaly. Despitethe shorter second flight, Weitz and Murphy consider the Tulsa demonstration asuccess. The league was able to showcase the virtual raceway technology and flytwo rocket-powered X-racers together, all before an enthusiastic crowd of over30,000 fans.